A group of American college students embark on an expedition in search of gold throughout the war-torn jungles of Vietnam. Their dreams quickly unravel when an unintended detour leaves the group lost and wandering where many before them have curiously disappeared. A terrifying encounter at night makes them realize that they are not alone. Tensions brew, as echoes of the Vietnam War follow them through the battle-ravaged jungle. Will they find an escape or become the next victims of a savage and grisly war? M.I.A. 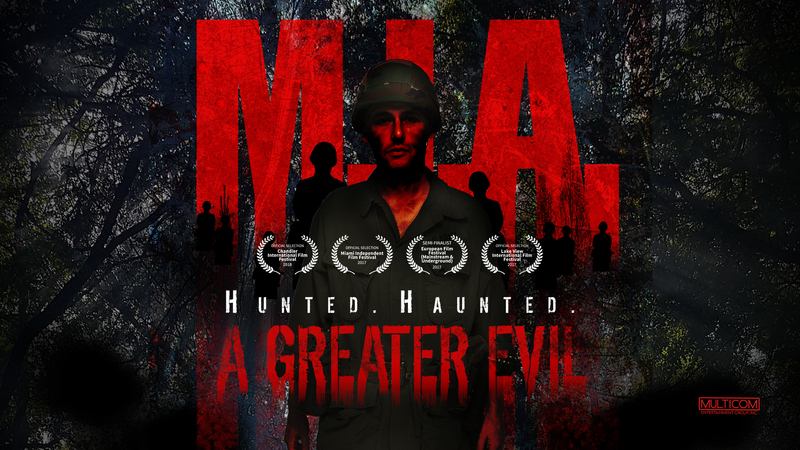 A Greater Evil is a thrilling horror film that touches on the conspiracy theories and notions surrounding the Vietnam War—those that suggest nearly 2,000 POWs were lost and kept captive in the jungles of Vietnam. M.I.A. deals with this as one of the greatest conspiracy theories of the 20th century, detailing the unknowns and the uncomfortable truths. The film aims to explore the nature of war-history, going beyond just getting a scare out of its viewers. As it begins, three American college students (Valerie Bentson, Sarah Ball & Mark Matula) and their Geology professor are in search of gold along a river in Vietnam. This stems from past stories of French gold miners finding riches within the waters, and the students as well as their professor seem intrigued. Amid rapids and detoured routes, there is talk of the War and the ominous presence it holds over the area, with the Geology Professor (Lamou Vissay) handling most of the factual exposition in the film. One of the students points out that her grandfather was deemed missing as a POW, which begins to set the scene as to MIA’s war-related storyline. Settling around a campfire after taking a detoured route, the group talks more in-depth about the war and its mysteries, with some of the characters ignorantly brushing off the past. Things take a turn when someone appears mysteriously at their camp site, and it is revealed that they are no longer alone. The writing (Peter Alan Lloyd) and direction (Abishek J. Baja) blend the character’s stories and pasts well with the trauma of their gold-mining adventure, with back-stories detailing POW relations, and one character’s historical ignorance and gold-lust. He states, “Jungles can play tricks on your mind…” but this is no regular jungle, and neither are its tricks, as things soon take a turn for the worst. The film shows how confusing the jungle can be, as it emulates the throes of war and mimics the trapped feelings of past soldiers. In just a 10-day period, the horror film was shot on location in Thailand – with actors trudging through the weeds, river waters and winding jungle trails. The authenticity of the film shines through in this memorable atmosphere and brings an interesting view on history; incorporating American college students and their perspective on the past. The film is unlike any of it’s kind, bringing credit to Vietnam’s past, while crafting a thrilling storyline to entertain us all. They use sound to their advantage, pulling on noises from the river and jungle,and emulating the apparent stillness of a jungle night. Overall, the flick provides you with the satisfaction of a horror film, with education in tow…didn’t think that was possible now did you? It gives an interesting take on the POW conspiracy theory that has been untapped as of yet by the horror film community, all while being respectful to veterans and POW’s families. The film was written by Peter Alan Lloyd, who has written articles and books in the subject of the Vietnam War, and Directed by Abishek J. Baja, who recently won the ‘Best Director’ Award at the Logcinema Art Films Festival. You can find the thriller premiering May 8th, 2018 on Amazon Prime, iTunes, Google Play and Cable VOD — check with your local teleco provider. You can find more information on M.I.A. A Greater Evil on Peter Alan Lloyd’s website.